A very special week is about to begin for approximately 30 students from Aalborg University, in Denmark, as their satellite - AAUSAT5 - waits to be launched to the International Space Station. 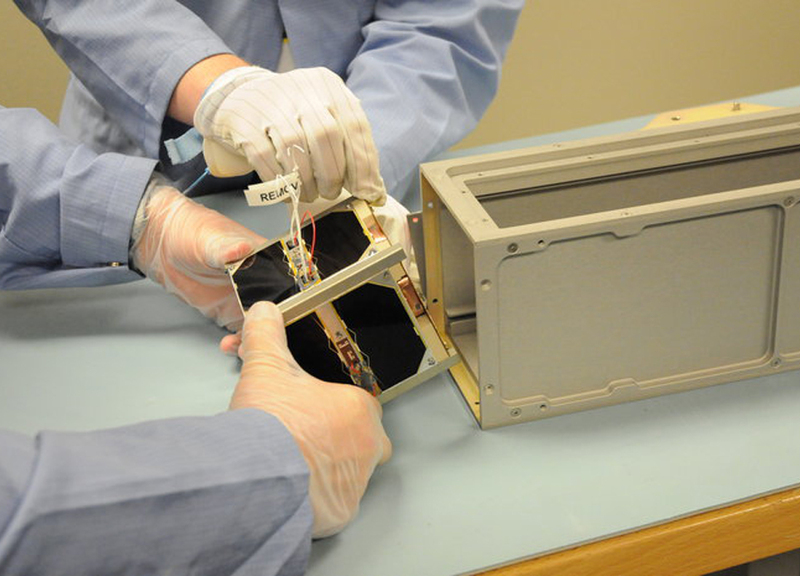 A few weeks later, AAUSAT5 will be deployed into orbit around Earth, marking the first ESA student CubeSat mission ever launched from the ISS: the pilot project of ESA's 'Fly Your Satellite from the ISS!' education programme. AAUSAT5, a CubeSat satellite entirely built by a university team with ESA's support, will reach the ISS aboard the Japanese HTV-5 cargo vehicle, planned to lift off from the Tanegashima Space Center in Japan. It will be accompanied by GomX-3, another ESA CubeSat, designed by Danish professionals. There may be a possibility, to be confirmed at a later stage, that AAUSAT5 and GomX-3, both Danish satellites, are released to orbit in conjunction with the mission to the ISS of ESA astronaut Andreas Mogensen, the first Danish astronaut ever. Andreas will be on the station for 2 weeks, starting on 2 September. After deployment, AAUSAT5 will start its technical mission: test, in orbit, an improved version of an automated positioning system. This system is designed to track and identify ships transiting away from coastal areas and in remote areas, thereby creating potential for safer use of new shipping lanes. "It is by going through the whole process of setting objectives for a space mission, and then designing, building, testing, and operating a spacecraft that can achieve these objectives, that the students acquire an powerful experience in the space sector, while still completing their studies," said Piero Galeone, Head of the Tertiary Education Unit at ESA. "Our mentoring efforts are all aimed at helping the students become more competent and mature for the labour market when the time comes." Updates regarding the exact HTV-5 launch time will be made available on this website as soon as they are known. Watch the launch on NASA TV and follow the AAUSAT5 mission with us on the ESA Education portal! 'Fly Your Satellite! ', ESA's most thorough educational CubeSat initiative to date, is a programme aimed at offering university student teams the opportunity to gain exemplary engineering and project management experience in designing, building, testing, launching, and operating a small satellite a CubeSat indeed from cradle to grave. With AAUSAT5, the ESA Education Office is piloting the opportunity to use the International Space Station as a possible means, in addition to conventional rockets, to recurrently deploy student CubeSats into low Earth orbit; this would represent 'Fly Your Satellite from the ISS! ', as an extension of the 'Fly Your Satellite!' programme. ESA is providing the AAUSAT5 team with the launch opportunity on board the HTV-5 launch vehicle and the deployment from the International Space Station free of charge, as well as technical and financial support for the pre-launch activities (for satellite integration and testing, and for the delivery to Houston, US, where the satellite has been integrated with the NanoRacks CubeSat Deployer (NRCSD).